The ProForm 480 CrossWalk treadmill is part of Icon Fitness’s line of budget machines. It comes with moveable arms to provide an upper body workout, although actual results for this type of fitness activity never seem to live up to the hype. The ProForm 480 CrossWalk treadmill has a blue-tinted LCD Display that’s very easy to use and understand. It tracks your workout and provides quick options for choosing manual or preset programs, as well as adjusting speed. For programming, it includes 6 Interactive CrossWalk® Workouts to help tone the arms, shoulders, and back; and 6 Personal Trainer Workouts which control the machine’s speed in each of the aerobic, weight loss or performance goals programs. UPDATE: The ProForm 480 has been discontinued. Check out the new ProForm lineup to find a comparable machine. 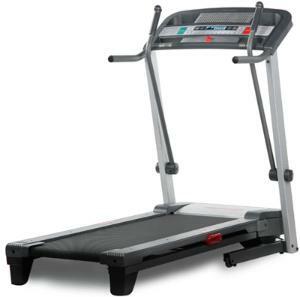 In recent years, many treadmill manufacturers have done a commendable job in matching better components with attractive features in low end models. Unfortunately, ProForm keeps putting wimpy motors in budget machines such as the ProForm 480 CrossWalk and still expects to stay competitive. This is a case of buyer beware. Experts advise customers that any treadmill motor rated as HP reflects Peak Horsepower (a short time period rating), and not Continuous Horsepower, which is what is put out by the motor when a person is walking continually on the moving belt. Therefore, a 2.75 HP motor will deliver only around 1.25 continuous duty, or about enough juice to power the brains of the engineers that paired this weak motor with a 55" belt. Okay, maybe it performs a little better than that, but this unit would be best suited for walkers who are lightweight and don’t intend to run on the belt. 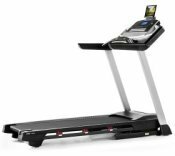 Customers who bought the ProForm 480 CrossWalk treadmill have remarked in treadmill reviews that they have mixed feelings about their purchase. They advise that to keep from stressing out the motor, you should not walk on it for more than an hour a day. Also, the arms tend to squeak, and there are some assembly issues out of the box. They also remark that the ProForm 480 CrossWalk’s workout arms put the user right up at the front of the machine, which may feel awkward if you are constantly looking at your feet and trying not to strike the front base cover. The $799 MSRP ProForm 480 CrossWalk does not offer solid value to match this price. Considering what other Icon Fitness brands such as NordicTrack and Gold’s Gym offer, this unit fails to match up in comparisons. Any treadmill should offer a minimum of 1.5 continuous duty horsepower since that rating is crucial to how your machine will operate efficiently. This model also fails in the areas of reliability, cushioning, warranty, noise, and walking area. If you feel moving arms on a treadmill give you a good upper body workout, then forget the ProForm 480 CrossWalk treadmill and check out the Gold’s Gym Maxx CrossWalk 650.